Former California Gov. 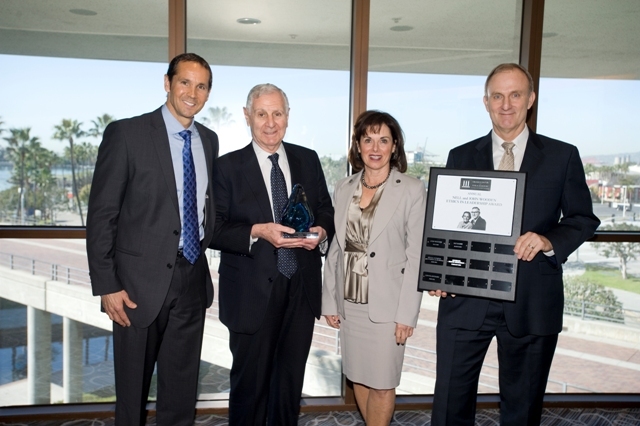 George Deukmejian (second from left) is honored with an ethics award in 2013. File photo. Former California Gov. George Deukmejian, who served two terms as the state’s chief executive in the 1980s, died today at his home in Long Beach at age 89. Deukmejian’s family confirmed his death in a statement to the Los Angeles Times. A former member of the state Assembly and an ex-California attorney general, the Republican Deukmejian was the first person of Armenian descent to serve as a governor. He was elected to the Assembly in 1962, then to the state Senate four years later. He became California attorney general in 1979 and served in that role until he was elected governor in 1983. A native of New York, Deukmejian’s parents came to the United States to escape the Armenian genocide. He earned his law degree from St. John’s University, and he served as an attorney during a three-year stint in the U.S. Army. He moved to California in 1955 after leaving the Army, and he set up a law practice in Long Beach. He eventually decided to run for public office, fueled by a passion for law enforcement and public safety. As governor, he championed prison construction and oversaw a tripling of the state’s prison population. Despite the increase in prison spending, he was credited with dramatically slashing the state’s budget deficit. Deukmejian married his wife in 1957, and they had two daughters, Leslie and Andrea, and a son, George. In the 2011 interview with the Press-Telegram, he pointed to his overhauling of the state Supreme Court as a hallmark of his governorship, while also improving the state’s business climate.